If you’re looking for a dish that’s light yet perks up your palate, then this is ideal. 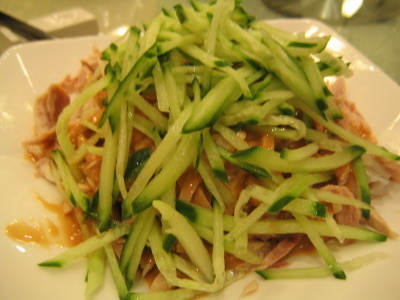 The mixture of hot chilli and cool cucumber is irresistible. Gochuchang is available in Asian grocers or Chinatown. If you can’t find it, don’t leave it out as it’s an essential flavouring in this dish – use miso paste, which is more widely available, instead, combined with red chilli powder to taste. Serve warm, cold, or at room temperature – all give different textures and are equally delicious. Serves 4 to 6. 1. Cook the noodles according to packet instructions. Then drain, rinse in cold water, and place them a large bowl. Immediately add sesame oil, and toss around with a fork and a spoon to ensure that they don’t stick. 2. In a separate bowl, combine soy sauce, vinegar, sugar, gochujang, garlic and spring onions. 3. Drain the shiitake mushrooms, carefully removing any grit, and slice them. Add the sauce, mushrooms and cucumber to the noodles, and toss gently until everything is mixed thoroughly. 4. Pile the noodles in the centre of a large serving platter. Surround them with egg slices and radish flowers for decoration, and top with sesame seeds and shredded cucumber peel before serving.